We’ve had an amazing year together. All of you – our beloved program participants, volunteers, partners, and donors – make our community something for which we are all grateful. We are pleased to announce that we recently approved our next strategic plan to guide our work over the coming years. Our plan was created with generous support from Meyer Memorial Trust, and with your feedback in mind. We’ve adopted a big vision to inspire a generation of leaders who will leave a positive legacy for future generations. We’d love to share our plans with you. We’re hosting a few informal conversations in December (see links on the right), so you can get in on the ground floor of our work for the next three years. Click on one of the links below to sign up. We’ll reveal our major program initiatives and invite your ideas to grow and support our community. Warmest wishes for a holiday season filled with love, laughter and connection. We’re coming to you! 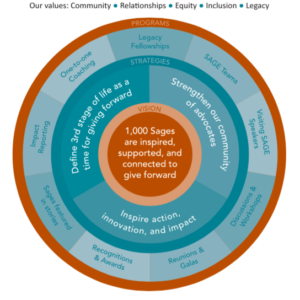 Register below for an information session about SAGE’s work over the coming years.